There are only a handful of metrics by which 2009 didn’t end as a successful year for AMD. With the launch of the Radeon HD 5800 series in September of that year AMD got a significant and unusually long-standing jump on the competition. By being the first company to transition a high-end GPU to TSMC’s 40nm process they were able to bring about the next generation of faster and cheaper video cards, quickly delivering better performance at better prices than their 55nm predecessors and competitors alike. At the same time they were the first company to produce a GPU for the new DirectX 11 standard, giving them access to a number of new features, a degree of future proofness, and good will with developers eager to get their hands on DX11 hardware. Ultimately AMD held the high-end market for over 6 months until NVIDIA was able to counter back with the Fermi based GTX 400 series. Though it’s not unprecedented for a company to rule the high-end market for many months at a time, it’s normally in the face of slower but similar cards from the competition – to stand alone is far more rare. This is not to say that it was easy for AMD, as TSMC’s 40nm production woes kept AMD from fully capitalizing on their advantages until 2010. But even with 40nm GPUs in short supply, it was clearly a good year for AMD. Now in the twilight of the year 2010, the landscape has once again shifted. NVIDIA did deliver the GTX 400 series, and then they delivered the GTX 500 series, once more displacing AMD from the high-end market as NVIDIA’s build’em big strategy is apt to do. In October we saw AMD reassert themselves in the mid-range market with the Radeon HD 6800 series, delivering performance close to the 5800 series for lower prices and at a greater power efficiency, and provoking a price war that quickly lead to NVIDIA dropping GTX 460 prices. With the delivery of the 6800 series, the stage has been set for AMD’s return to the high-end market with the launch of the Radeon HD 6900 series. 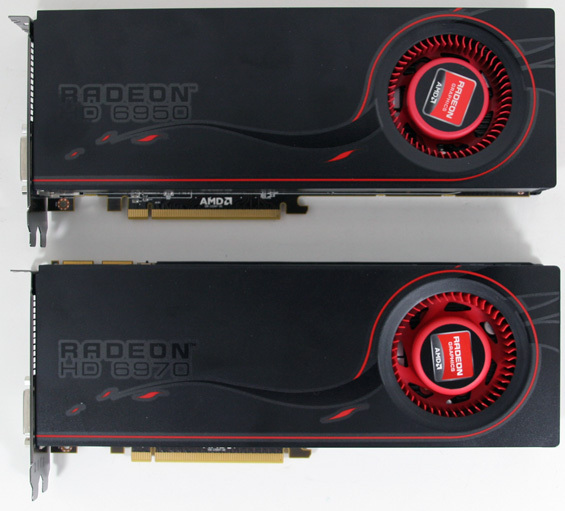 Launching today are the Radeon HD 6970 and Radeon HD 6950, utilizing AMD’s new Cayman GPU. Born from the ashes of TSMC’s canceled 32nm node, Cayman is the biggest change to AMD’s GPU microarchitecture since the original Radeon HD 2900. Just because AMD doesn’t have a new node to work with this year doesn’t mean they haven’t been hard at work, and as we’ll see Cayman and the 6900 series will brings that hard work to the table. So without further ado, let’s dive in to the Radeon HD 6900 series. Following AMD’s unfortunate renaming of its product stack with the Radeon HD 6800 series, the Radeon HD 6900 series is thus far a 3 part, 2 chip lineup. Today we are looking at the Cayman based 6970 and 6950, composing the top of AMD’s single-GPU product line. Above that is Antilles, the codename for AMD’s dual-Cayman Radeon HD 6990. Originally scheduled to launch late this year, the roughly month-long delay of Cayman has pushed that back; we’ll now be seeing the 3rd member of the 6900 series next year. So today the story is all about Cayman and the single-GPU cards it powers. At the top we have the Radeon HD 6970, AMD’s top single-GPU part. Featuring a complete Cayman GPU, it has 1536 stream processors, 96 texture units, and 32 ROPs. It is clocked at 880MHz for the core clock and 1375MHz (5.5GHz data rate) for its 2GB of GDDR5 RAM. TDP (or the closest thing to it) is 250W, while reflecting the maturity and AMD’s familiarity with the 40nm process typical idle power draw is down from the 5800 series to 20W. Below that we have the Radeon HD 6950, the traditional lower power card using a slightly cut-down GPU. The 6950 has 1408 stream processors, 88 texture units, and still all 32 ROPs attached to the same 2GB of GDDR5. The core clock is similarly reduced to 800MHz, while the memory clock is 1250MHz (5GHz data rate). TDP is 200W, while idle power is the same as with the 6970 at 20W. From the specifications alone it’s quickly apparent that something new is happening with Cayman, as at 1536 SPs it has fewer SPs than the 1600 SP Cypress/5870 it replaces. We have a great deal to talk about here, but we’ll stick to a high-level overview for our introduction. In the biggest change to AMD’s core GPU architecture since the launch of their first DX10/unified shader Radeon HD 2900 in 2007, AMD is moving away from the Very Long Instruction Word-5 (VLIW5) architecture we have come to know them for, in favor of a slightly less wide VLIW4 architecture. In a nutshell AMD’s SIMDs are narrower but there are more of them, as AMD looks to find a new balance in their core architecture. Although it’s not a new core architecture outright, the change from VLIW5 to VLIW4 brings a number of ramifications that we will be looking at. And this is just one of the many facets of AMD’s new architecture. Getting right to the matter of performance, the 6970 performs very close to the GTX 570/480 on average, while the 6950 is in a class of its own, occupying the small hole between the 5870/470 and the 6970/570. With that level of performance the pricing for today’s launch is rather straightforward: the 6970 will be launching slightly above the 570 at $379, while the 6950 will be launching at the $299 sweet spot. Further down the line AMD’s partners will be launching 1GB versions of these cards, which will be bringing prices down as a tradeoff for potential memory bottlenecks. Today’s launch is going to be hard launch, with both the 6970 and the 6950 available. AMD is being slightly more cryptic than usual about just what the launch quantities are; our official guidance is “available in quantity” and “tens of thousands” of cards. On the one hand we aren’t expecting anything nearly as constrained as the 5800 series launch, and at the same time AMD is not filling us with confidence that it will be widely available like the 6800 either. If at the end of this article you decide you want a 6900 card, your best bet is to grab one sooner than later. With the launch of the 6900 series, the 5800 series is facing its imminent retirement. There are still a number of cards on the market and they’re priced to move, but AMD is looking at cleaning out its Cypress inventory over the next couple of months, so officially the 5800 series is no longer part of AMD’s current product stack. Meanwhile AMD’s dual-GPU 5970 remains an outlier, as its job is not quite done until the 6990 arrives – until then it’s still officially AMD’s highest-end card and their closest competitor to the GTX 580. Meanwhile NVIDIA’s product stack and pricing stands as-is. Anand also tested with 'outdated' drivers. It is ofcourse AMD fault to not supply the best drivers available at launch though. But anand used 10.10, Reviews that use 10.11 like HardOcp see that the 6950 performance equally or better than 570GTx!! and 6970 trades blows with 580GTX but is overall little slower (but faster than 570GTX). 10.12 don't seam to improve performance. That said, Anand would it be possible to change your graphs? Starting with the low quality and ending with the high quality? And also make the high quality chart for single cards only. Now it just isn't readable with SLI and crossfire numbers through it. $740 for HD6970 CrossfireX dominates GTX580 SLI costing over $1000. That's some serious ownage right there. Good pricing on these new cards and solid numbers for power/heat and noise. By a small average amount, and for ~$250 extra. True. However AMD has just about always been about value over an all out direct card horsepower war with Nvidia. Some people are willing to spend for bragging rights. A lot of people were anxious to see what AMD will bring to the market with 6950/6970. And once again not much. Some minor advantages (like 5FPS in handul of games) is nothing worth writing or screaming about. For now GTX580 is more expensive, but now with AMD unveiling new cards nVidia will get really serious about the price. That $500 price point won't live for long. I expecting at least 50$ off that in the next 4-6 weeks. at that price point a 580 the best buy, get lost. The 580 is way over prized for the small performance increase it has above 570-6970 not to mentioning the additional power consumption. Don't see any reason at all to buy that card.